12h and 24h, completely themeable, and moving eyes. 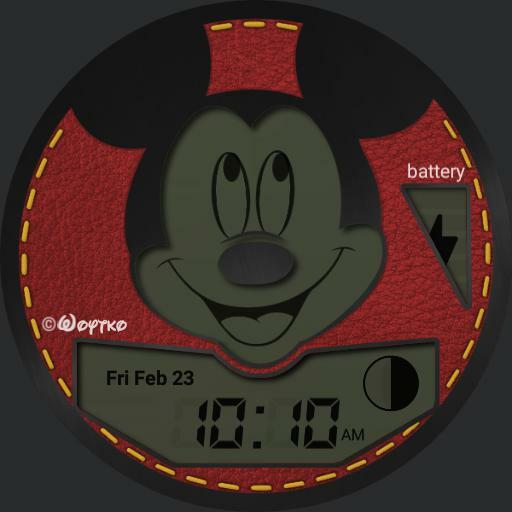 Based off of a vintage digital Mickey Mouse watch. Dim mode Themeable with color picker. In bright mode, face color, background color, and thread can be changed. Tapping the time will change it from 12h to 24hr and vice versa. Tapping the 12 oclock area will change thread color. Tapping left side text will change the face/frame color. Tap the left side above the text to change the complimenting background color. Removed the rounded bezel as I felt it detracted from the overall design.